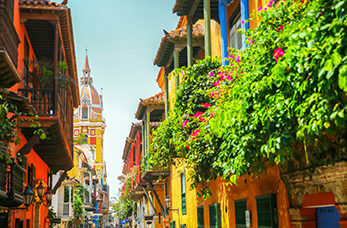 Cartagena is a city on the northern coast of Colombia and is steeped in history, this was the transit port for all the wealth Spain derived from South America. Cartagena's colonial walled city and fortress were designated a UNESCO World Heritage Site. The port, fortresses and monuments in the historic centre of Cartagena were selected in 1984 as a UNESCO World Heritage site. Take a stroll through the winding streets lined with Spanish Colonial architecture, bars and restaurants. Walk the cobblestone streets of Las Murallas "the walls of the city" and you will be transported in time taking in the sights of the most impressive city walls in the world. Visit the palace museum and marvel at the fine examples of colonial architecture, behind a charming facade the museum displays torture instruments of "dark" days gone by. One of the largest in a series of fortresses which was attacked by Sir Francis Drake's cannons. The building was finished in 1612. This 17th century monastery built on top of a hill offers a spectacular view of the city. This museum offers a fascinating collection of gold and pottery of the Tayrona, Calima and Sinu people.